National and international experts discuss the economic outlook for Arkansas, the nation, and the world. Located in the Sam M. Walton College of Business, the Center provides applied economic and business research to federal, state, and local government, as well as to businesses currently operating or those that desire to operate in the state of Arkansas. The Center further works to improve the economic opportunities of all Arkansans by conducting policy research in the public interest. 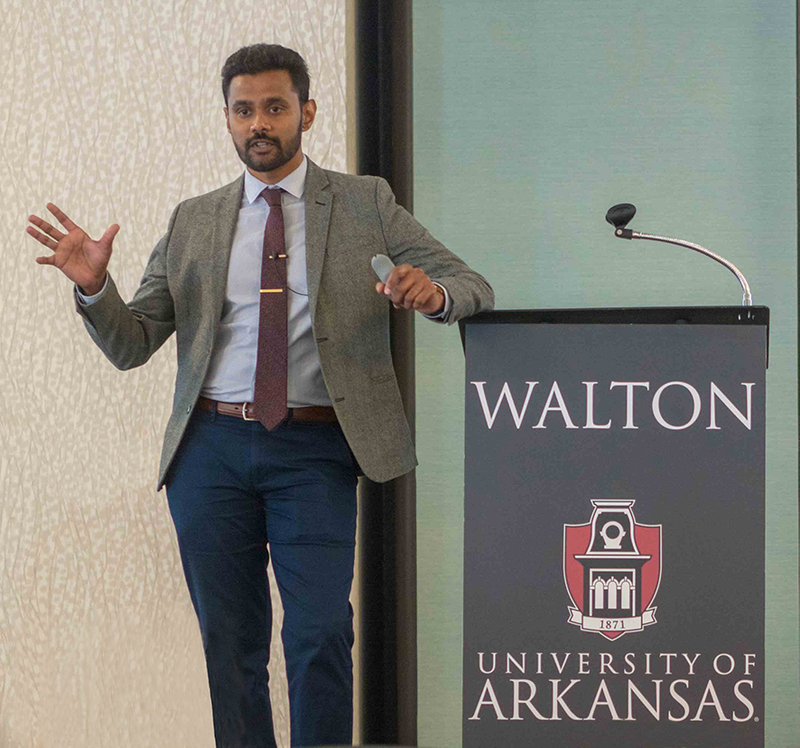 Mervin Jebaraj, Director of the Center for Business and Economic Research at the Sam M. Walton College of Business at the University of Arkansas, will present the Quarterly Business Analysis on Thursday, May 16, 2019. The event is scheduled from 11:45 a.m. -1:00 p.m. at the Hilton Garden Inn Fayetteville, 1325 North Palak Drive. Networking and registration will begin at 11:00 am. 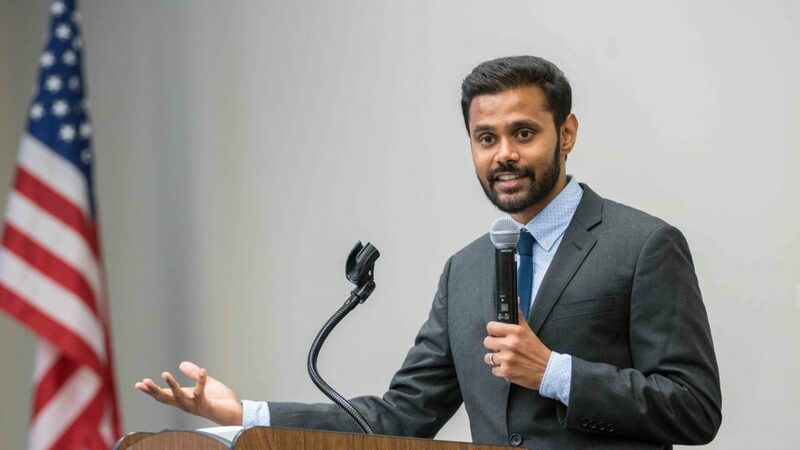 "The program will take a look at new economic data for the nation, Arkansas and Northwest Arkansas, the reasons behind the Federal Reserve's change in monetary policy stance, the effect of yield curve inversions and the lingering effects of the tax cuts and trade wars," Jebaraj said. "As the national economic growth reverts to long-term trends, timely economic information is vital to good business and policy decision making." Registration and networking will begin at at 11:00 a.m. at the Hilton Garden Inn located at 1325 North Palak Drive in Fayetteville. Attendees will be able to network with other Northwest Arkansas community leaders before the program begins at 11:45 a.m. The program lasts for approximately 75 minutes, including time for questions and answers. The cost of the luncheon program is $45. For additional information, visit the Quarterly Business Analysis website. To register using a credit card, please register below. For other registration options, please call 479-575-4151. Preregistration by Friday, May 10, is required. We hope to see you on Thursday, May 16, 2019 for an informative event. 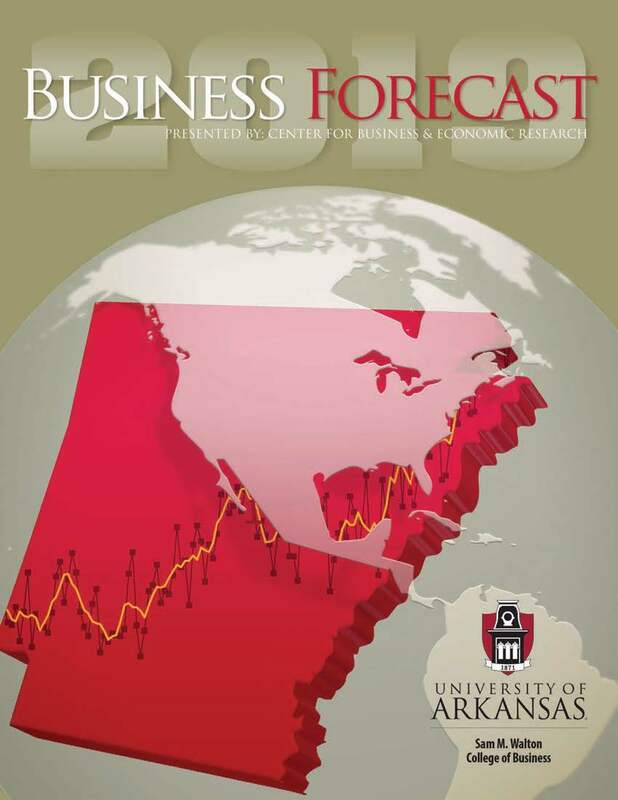 Each year, the Center for Business & Economic Research hosts the Business Forecast Luncheon, bringing together national and international experts to discuss the economic outlook for Arkansas, the nation and the world. Business Forecast 2019 was a great success, with over 1200 registered. The program from the speakers is now available! The 25th Annual Business Forecast Luncheon will be held from 11:30 a.m. to 1:30 p.m. Friday, February 1, 2019 at the John Q. Hammons Convention Center in the World Trade Center District in Rogers. To register, please visit the Business Forecast webpage or follow the registration links below. For questions or other registration options, please call 479-575-4151. We hope to see you on Friday, February 1st for an informative event. Moderator Steve Gibbs, is senior vice president, chief accounting officer and controller at Tyson Foods, Inc. Steve is responsible for leading, coordinating and directing Corporate Finance and Accounting to provide complete, accurate, timely and actionable financial information that contributes to the achievement of business and strategic objectives. International Forecaster Carolyn Evans, is head economist and senior data scientist at Intel Corporation. Prior to joining Intel, Carolyn held the positions of Associate Professor of Economics at Santa Clara University, Senior Economist at the Board of Governors of the Federal Reserve, Senior Staff Economist for International Trade on the President's Council of Economic Advisers, and Economist at the Federal Reserve Bank of New York. 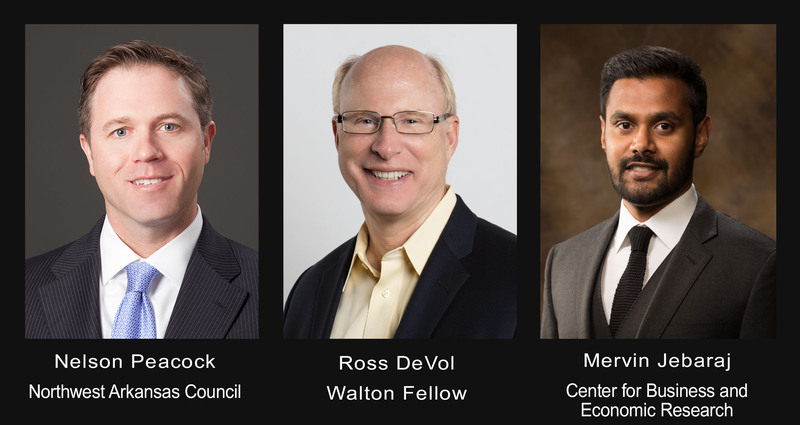 Domestic Forecaster Ross DeVol, is a Fellow at the Walton Family Foundation and is currently transitioning to lead the new Core Economic Institute (a think and do tank) improving economic performance in the center of the United States. The Institute will pursue its mission through independent, data-driven research, action-oriented convening and impactful policy recommendations. 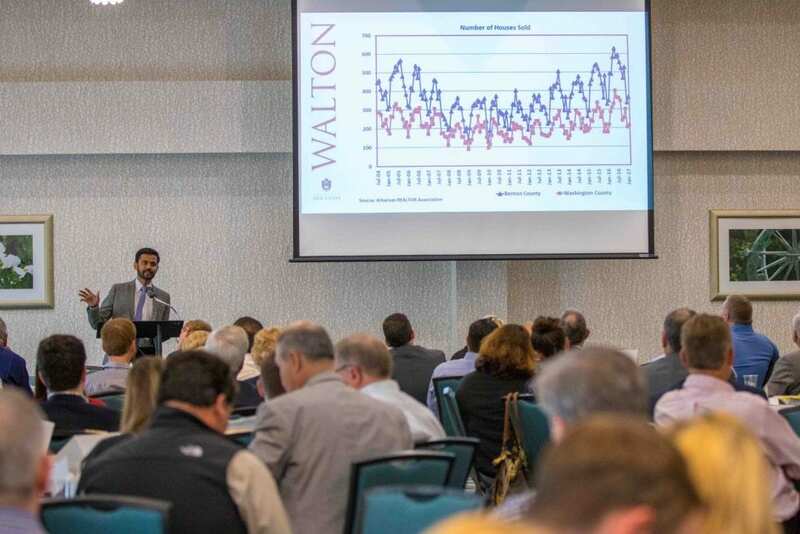 Regional Forecaster Mervin Jebaraj, director of the Center for Business and Economic Research, will provide the usual state and local economic forecast at the luncheon. Detailed biographies of the speakers are on the Business Forecast page. Individual tickets are $85 each with the option to purchase a table of ten for $850.00. Pre-registration is required. The deadline for registration is January 25, 2019. Reservations can be made by registering online or by calling 479-575-4151. For sponsorships opportunities, please call our office or complete the Business Forecast Sponsor Packet. Additional sponsorship information can be found at our Business Forecast Sponsor Page. The Center for Business and Economic Research in the Sam M. Walton College of Business at the University of Arkansas, in collaboration with the Northwest Arkansas Council, released the eighth annual State of the Northwest Arkansas Region Report. The 2018 State of the Region Report was released on September 25, during a 90-minute luncheon program at the Northwest Arkansas Board of Realtors Event Center at 314 N. Goad Springs Road in Lowell. Attendees arrived at 11:00 a.m. for networking and registration. Ross DeVol, a fellow of the Walton Family Foundation focused on research into policies related to economic vitality of Northwest Arkansas and America's heartland; Nelson Peacock, president and chief executive officer, Northwest Arkansas Council; and economist Mervin Jebaraj, director of the university's Center for Business and Economic Research presented economic analysis, data and information. Peacock presented the Greater Northwest Arkansas Development Strategy, a plan outlining the Northwest Arkansas Council's pursuits over the next three years. DeVol focused on the importance of education and knowledge in metropolitan growth, talk about universities that excel in technology transfer, describing Utah's success, spurred by decisions to expand science and technology investment made nearly 20 years ago. 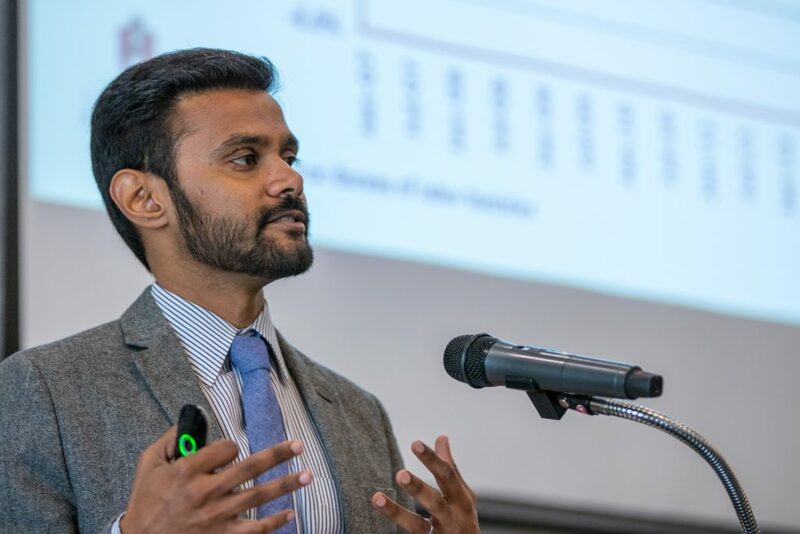 Jebaraj focused on economic highlights in the State of the Northwest Arkansas Region Report as well as economic data and statistics from the Center for Business and Economic Research's Quarterly Business Analysis. The State of the Northwest Arkansas Region Report is widely viewed as one of the best measures of performances comparing peer regions such as Madison, Wisconsin; Raleigh, North Carolina; Provo, Utah; Des Moines, Iowa; and Austin, Texas. Individual tickets are $45 each with the option to purchase a table of eight. Pre-registration is required. The deadline for registration is Friday, September 21. Reservations can be made for the luncheon at http://cber.uark.edu/ or by calling 479-575-4151. Find economic statistics from national, Arkansas, and specific metropolitan areas. Do you wish to contact someone from the Center for Business and Economic Research?